We set up shop with a card table, a piece of recycled cardboard and some Country Time lemonade. There were at least four of us, between my sister Emily and the neighbor girls. We went three blocks away to the nearest intersection in our Beaverton suburb, to maximize traffic and therefore, profits. Then we used our impressive marketing acumen and I crossed the street from our awesome lemonade stand to lure in customers. A big moving truck pulled up to the stop sign, and the man in the passenger seat rolled down his window and asked how much lemonade cost. “25 cents!” I said, in my most salesmanlike tone. He seemed impressed with the value, and asked me to come closer to the truck so he could hand me his quarter. Freshly primed on stranger danger videos, I panicked. Absolutely convinced that he was about to abduct me and out of sight from my friends and sister across the street from the massive truck, I froze for a second and then I went into fight-or-flight mode. I dropped my sign and I ran as fast as I could toward home. I turned the corner just as the truck moved, and my friends and sister saw, where I had been standing, just my sign on the ground. No sign of me. So much for summer fun. 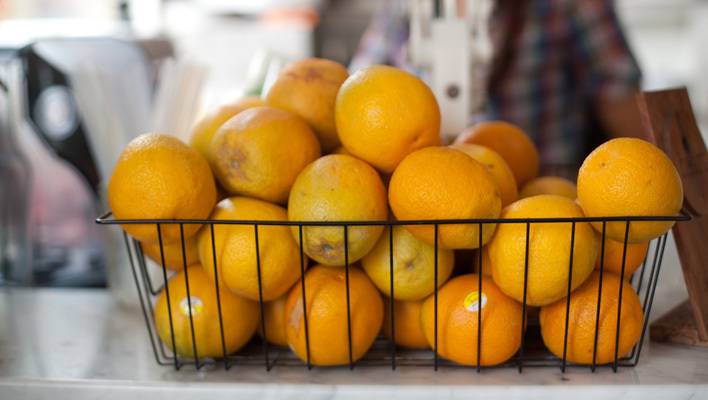 It’s tough work selling juice from a stand, but that’s what they do at Sip Juice Cart. 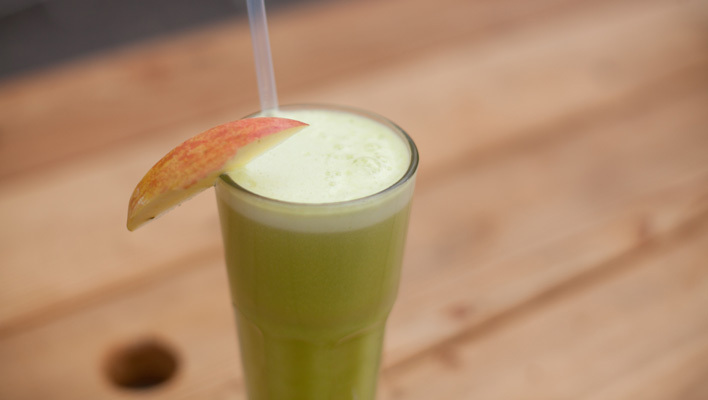 On a very friendly personalized recommendation, I ordered the Sweet Greens juice, which has four kinds of greens plus apple juice for sweetness and ginger for a nice kick. It was delicately flavored and the satisfying color of the flesh of a perfectly ripe avocado. They also offer smoothies and vegan milkshakes, which looked pretty decadent. 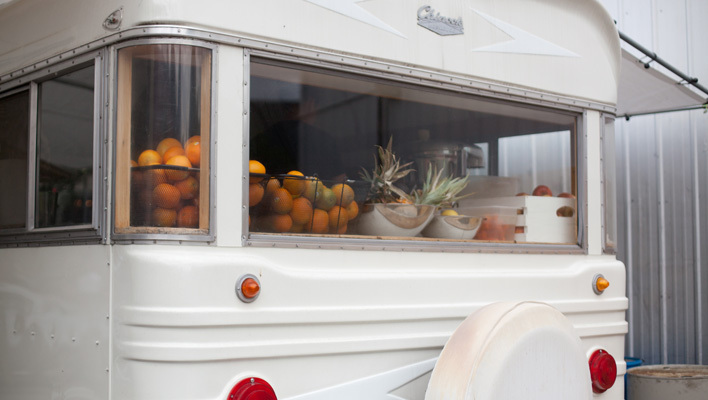 I think my favorite part about grabbing a quick afternoon juice here is the design of the place — in the back window of the trailer, you can see piles of fresh oranges, pineapples and other fruit just waiting to be juiced. You can sit on the picnic table and enjoy a moment of zen and it’s lovely. 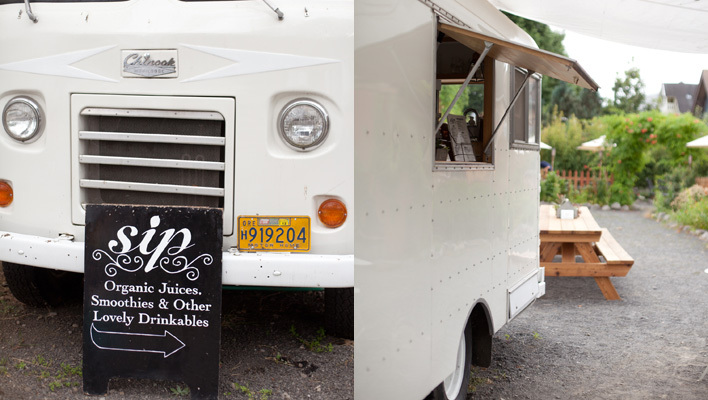 Sip, located at 2210 NE Alberta St. in NE Portland’s Alberta Arts District, is actually the second location of this fine cart. You can find the first one at 3029 SE 21st Ave. 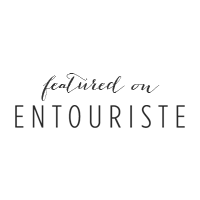 Follow them on Twitter, too! We’re a real estate family, and as such, every year we visit the Street of Dreams. These houses are absolutely crazy visions for fancy lifestyles, and usually located on big plots of land far away from the city. You can walk through bedroom after bedroom, admiring high-tech home gadgets and over-the-top interior design. The one that put it all to shame was the Tiffany nursery. It was at least five years ago, and in one of the houses, there was a bedroom. It was designed for a little girl, and the walls were Tiffany blue (matched exactly, I’m sure, to that signature shade). In the middle of the room hung an elaborate chandelier. “I want this,” my sister Emily said, as she entered the room. She shuffled us all into the room and imagined it as her one-day nursery for a far-off twinkle in her eye. We looked, and then we moved on to the other houses. But not Emily. She kept that room locked into the vault of her mind for years and when I remodeled my house last year, a look came over her face as she walked through one day. “What are you going to do with that chandelier?” she asked. I shrugged. “Can I have it?” And I saw the look — she was taking the first step to building a Tiffany nursery with a chandelier for a twinkle in her eye that might be a reality someday soon. I know she’ll create a room that’s sweet and perfect. 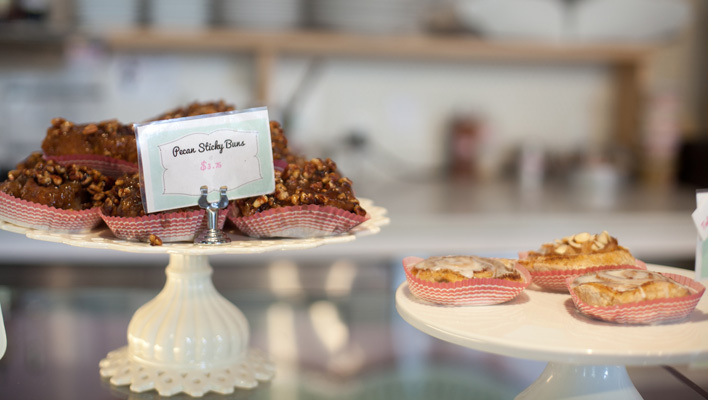 That kind of sweet, girly charm is what I found at Petunia’s Pies and Pastries. 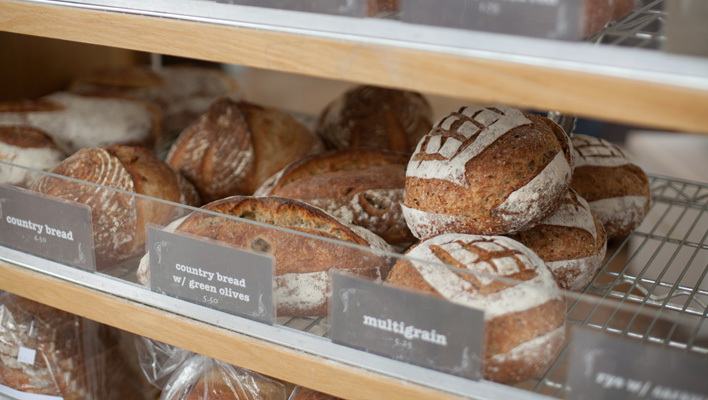 What started as a farmer’s market stand a few years back has now snagged a prime location sandwiched between two of the cutest shops in the West End district and has made a soothing and seriously adorable little spot. 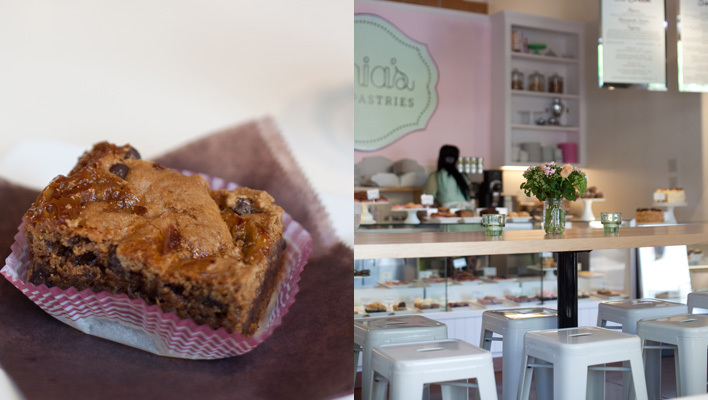 Pink walls, vases of fresh flowers and gorgeous vegan and gluten-free pastries abound. It’s a great place to take a decadent little afternoon break. Sit by the window, enjoy a salted caramel cookie bar (one of the shop’s best sellers) and an iced tea and dream about what the future might bring. 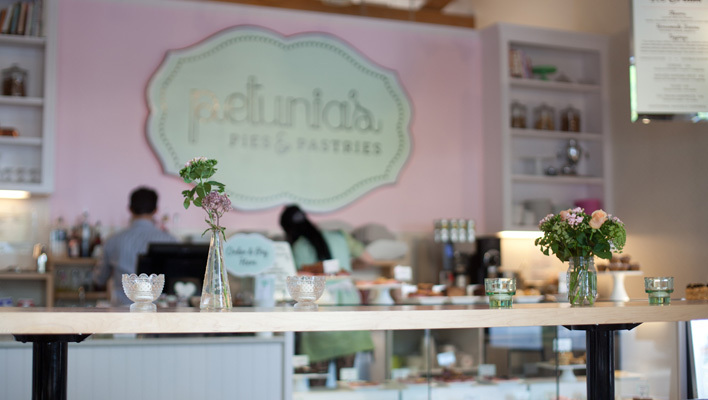 Petunia’s Pies and Pastries, 610 SW 12th Ave., in downtown’s hip West End district. We hopped on a plane and we went to Las Vegas — five women who had just met a handful of times and wanted to learn more at a photography conference. We had our profession in common, but otherwise we were practically strangers. But something about a hotel suite, a batch of fun parties and exploring the conference together bonded us, and we decided to keep in touch after we arrived back home in Portland. Annie, Christy, Deyla, Melissa and I met up a few weeks after that conference for coffee and shop talk at Lovejoy Bakers. We were new friends, we were still discovering things about each other and we talked mostly about business as we got to know certain personal details about one another. Just a few weeks ago, as I sat and had lunch with a couple of these girls, it hit me — this place saw the birth of a friendship. It morphed from the five of us comparing notes about photography into a much deeper connection. When Melissa, and then Christy, announced that they were expecting babies, we hugged and celebrated. Now those babies are here, and when we meet together, we hold them and pass them around. I’m so grateful for my friends, but I’m also grateful for the place that provided the morning coffees, sandwiches and treats that got the ball rolling. 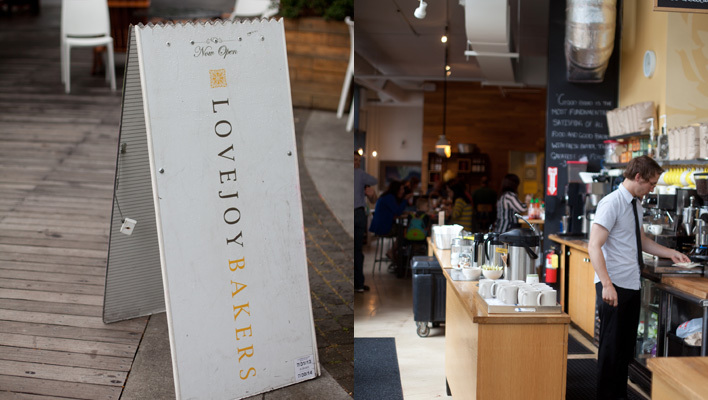 Lovejoy Bakers, a bustling spot in the Pearl District, is encased almost entirely in glass and overlooks the Portland Streetcar. The custom light fixtures, fashioned by local Pigeontoe Ceramics, add a touch of whimsy to the modern space. Snag a pillowy spot by the window and trust me, you’ll never want to leave. My personal favorite is the smashed chickpea sandwich, with fennel sliced super-thin and a lemony substance inside that’s pure magic. It’s vegan, and they’ll swap out the non-vegan potato salad for you gladly, but usually I just eat it, because as far as potato salads go, it’s delicious. Lovejoy Bakers, NW 10th & Lovejoy in the Pearl District. Near the foot of the Broadway Bridge. October, 2010. It was our fourth wedding anniversary, and we wanted to go out and celebrate with a nice meal. Not hard here in this city — so I donned a dress and some lipstick and put on my nicest heels and we headed out. We went to a restaurant with a James Beard award. Silly me for assuming that people would get fancy. What was I thinking? They weren’t homeless at all — they probably lived in fancy houses in the Hawthorne neighborhood. But that’s our hipsters for you. This incident spurred a game that we play sometimes, guessing whether someone is a hipster or a hobo. 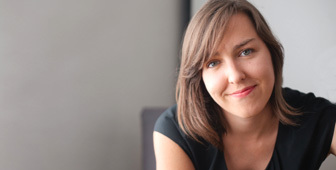 As I sat there, in my high heels, ordering a fancy anniversary dinner, our hipster friends sipped at their tall boys of Miller High Life and ate their impeccably cooked burgers. Long live the Portland hipster. Canteen feels like hipster ground zero. 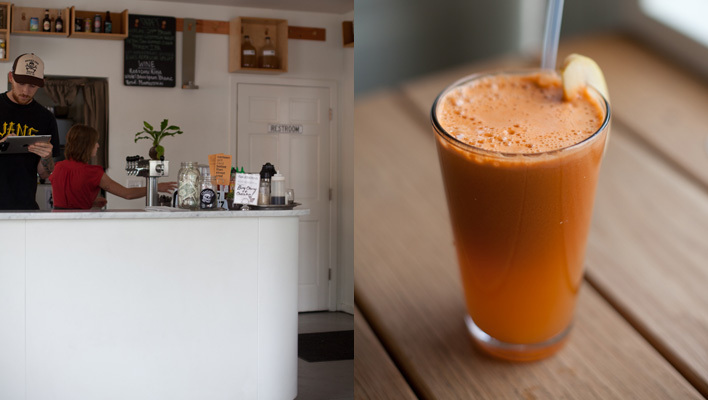 The juice, fresh pressed in front of your eyes by burly raw food enthusiasts, is great. It’s a place where our beloved hipsters with face tattoos feed their three-year-olds walnut taco crumbles and fresh pressed ginger juice. 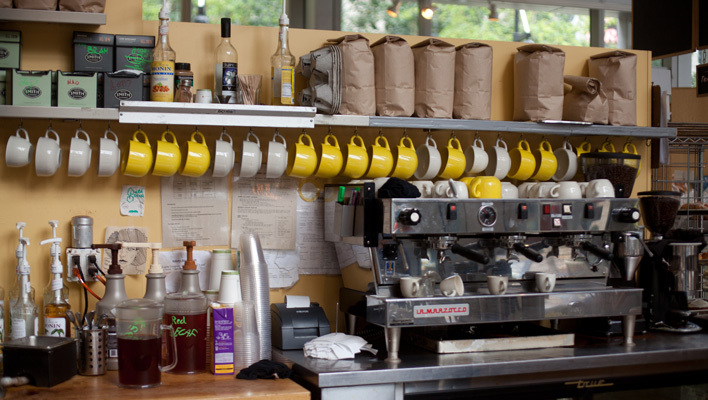 It might be indie Portland heaven. In the summer, there’s no better place. The people-watching on Stark is good, the chairs are comfy (or try the long old-growth timber bench running the length of the restaurant) and you can kick back and drink fresh juice while you people watch and play my favorite game. Highly recommended: The Walnut Taco salad and Super Veggie juice. 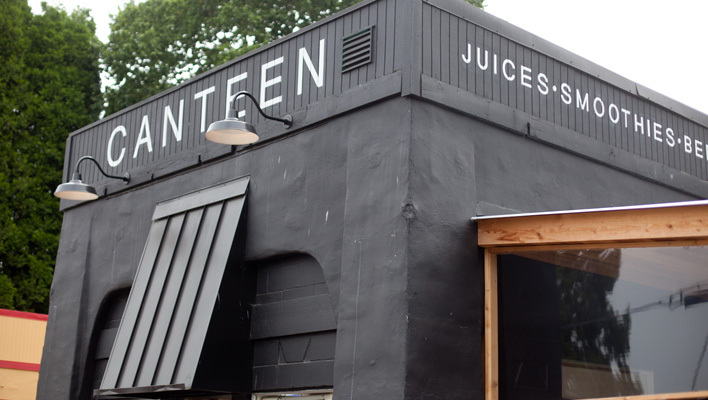 Canteen is at 2816 SE Stark St. in the Sunnyside neighborhood – just watch out for hipsters. Follow them on Twitter for even more juice.